Brewing matsutake mushroom beer. Matsutake mushrooms are pure white and smooth when young. As they mature they develop brown spots and scales. The caps are up to 20 cm across and have a curled edge to them when immature. The stems are up to 15 cm long, and are firm and full. They have a ring around the stem, which is left from the partial veil these mushrooms have when immature to protect their gills as they develop. Matsutake spores are white. They grow in the US, China, Korea, Northern European countries, and Japan. Matsutakes are usually found in pine and fir forests, and occasionally pair up with oak trees. They give off a pungent, spicy aroma and spice up a golden strong ale. It takes around 1.6 kg in 19 liters to get a good result. They love late summer and autumn in cold areas, and winter where temperatures are warmer. Matsutake mushrooms are not easy to grow unless you have the right type of pine trees in your backyard. Or, find yourself a pine forest where you can propagate the years of compost underneath the trees with Matsutake mushroom spores. Whether you are buying mushroom beer or brewing it yourself, get ready to enjoy a craft beer with unique ingredients. 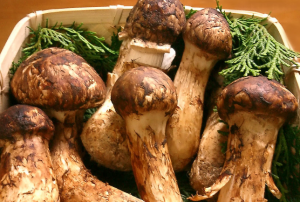 You’ll save money too because matsutake mushrooms can be expensive.